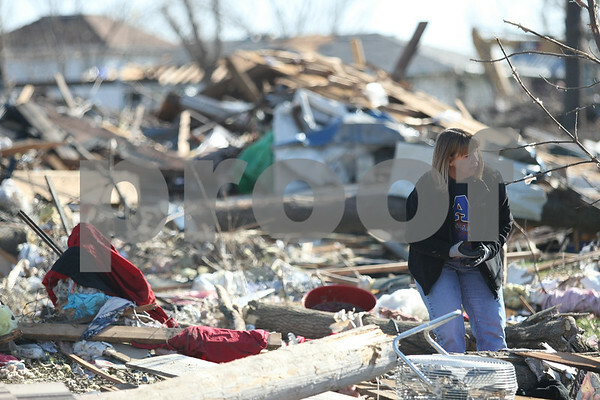 Teri Peterson, of Shabbona, sorts through the rubble of her mother Irene Clay's property two days after a tornado tore its path through the town on Saturday, April 11, 2015. Her sister, Geri Hopper, and brother-in-law, Ron Hopper, also lived with Clay at the time. Clay owned a two-story home on Brown Street and is hoping to build a one-story home if the DeKalb County Planning and Zoning Committee and the DeKalb County Board pass the rezoning amendment at the July 1 meeting.